Built by King Rama V in 1901, the exquisite golden teakwood mansion, also known as Vimanmek Palace, is located in the Dusit Palace complex. 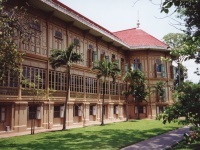 It was restored in 1982 for Bangkok's bicentennial and King Rama IX granted permission to transform Vimanmek Mansion into a museum to commemorate King Rama V by displaying his photographs, personal art and handicrafts, and to serve as a showcase of the Thai national heritage. The informative hour-long tour takes visitors through a series of apartments and rooms, a staggering 81 in total, in what is said to be the largest teak building in the world. It is now a major tourist attraction and a definite must for anyone visiting the intriguing city of Bangkok. Visitors to the Vimanmek Palace are required to dress modestly, meaning men must wear long pants and women must wear skirts or pants below the knee and have their shoulders covered. Sarongs are available to hire if you need to cover up, but they occasionally run out. *This museum is currently closed for renovation.